The Florida Gators of Gainesville Florida’s U.F. look to improve their record to 4-1 on the season under new head coach Will Muschamp this week as they head to Louisiana to face Les Miles and the LSU Tigers this weekend. 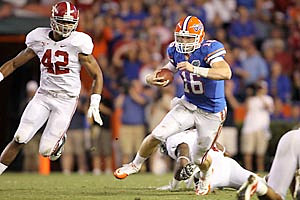 The Gators were undefeated until last Saturday when Alabama beat us at home for our first loss of the year. Louisiana State University’s football team has done a very good job against the Gators as of late, especially at home. It will be the Gators toughest challenge yet to go into Baton Rouge and beat the Tigers on their home turf. With John Brantley still ailing from an injury he suffered late last game, Florida may again turn to freshman QB Jeff Driskel as their signal caller. Driskel is a true freshman with a skills set that many people compare to our last Heisman quarterback, Tim Tebow, because of his blazing 4.5 second 40-yard dash speed as well as his vision as a runner and commitment to carry the football as a QB. Jeff Driskel has even been compared to a young Aaron Rodgers, the reigning Superbowl Champion starting quarterback for the Green Bay Packers. Go Gators!